Get a game ball from the home team coach. Check its condition and pressure. Look for markings that show it is official. They are a red EPYSA stamp and Jim Christian’s signature. 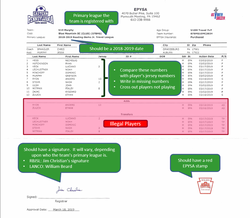 RBJSL policy is to not play the game if the coach cannot produce an Official Roster with the EPYSA stamp and Jim Christian's signature on it. Watch the coach log into a web app that has a digital record of the coaches he can have in the bench area and the players he can play. Let the coach handle the device being used to show you the digital pass deck. Don't touch it. Look for markings that show they are official. They are a red EPYSA stamp and Jim Christian’s signature. Why? Because re RBJSL Registrar, Jim Christian, has the ability to remove a coach or player from the digital deck at any time. So, although the player is a legal player, from the roster's standpoint, there may have been an incident, such as a sendoff, that has caused the league to remove the player from the deck and being able to play your game. If you have a coach trying to get a player into the game that is not in the digital deck, note it on your game report and an Incident (Supplemental) report, along with the name and number of the player. PLEASE NOTE - the coach moves through the digital passes by TAPPING on arrows in the bottom left corner of the pass. A SWIPING motion should be a red flag that the coach is possibly showing you downloaded pictures of the passes and not the live digital deck. If you think that is happening, ask the coach to swipe the pass an area anywhere on the pass that is not over the arrows. If that advances the pictures, the coach is trying to pull a fast one. Only tapping or poking at the arrows should work. RBJSL policy is to not play the game if a coach will not show you the live digital deck.